Which weren't any different than any other instructions I've seen. Started the lauter, and the wort was very cloudy. No problem, I poured it back in (carefully) and kept going. Did this ten times, and the wort was still cloudy, with visible bits in it. At that point, I gave up and drained it into my kettle, then sparged. Ended up with exactly the amount of wort I wanted, but obviously with more crap in it than I wanted. The question is, should I have kept lautering? Is that normal, to do it so many times? I was draining and re-adding a quart at a time, so that was 2.5 gallons, when I only got about 2 gallons of wort out of it. Couple bits that I don't know whether they matter: my temps didn't stay where I wanted them. After about 40 minutes, it dropped from 153 to maybe 145, and even adding a couple quarts at 170 didn't help. It was a 3-gallon batch with 6.2 pounds of malt. I crushed the malt at the beer store where I bought it - I guess I'm not entirely sure how finely it should be crushed. I should look that up. Don't worry about it. Sometimes the wort just isn't as clear as you would want. With BIAB, cloudy wort is pretty normal and it doesn't really affect the final quality. HOWEVER, cloudy wort can also be a sign of incomplete conversion. Might be worth doing an iodine check, just to be sure. Oh, I'm going to do a few batches. Thanks for the replies. Just as a heads up, when this happened to me recently, my OG was way off. A normal vorlauf for a 5 gallon brew takes much longer than what you’re describing... not sure about a 3 gallon. Overall, you will probably have a lower abv, maybe even a lighter taste. Huh. Since you mention it, my OG readings were way off. My pre-boil was only 25, where I was expecting maybe 42 (100% efficiency would have been 56-57). I hoped maybe it was because I took the measurement while the wort was still hot. Then my post boil OG was 47, which was higher than it should have been (unless my efficiency was way better than my first reading indicated). So when you say it takes a lot longer, you mean I should have kept going. Do you worry about oxidation at all, pouring the wort back into the tun? I don’t worry about oxidation until after the boil. That may be incorrect, but that’s just my opinion. I am suggesting that you needed to recirculate longer (vorlaufing). Overall it usually takes me about 30-45 minutes of recirculating before the wort is clear and free of debris. I hate this part of brewing, even more than bottling, so I bought a chugger pump to take the wort out of the tun and back up to the top. That way I can just turn the pump on and let it go for a while, rather than (pour into pitcher...pour back into run) over and over. Soungs to me like conversion still going on, and probable bad crush. Get your own mill or double crush and see if that leads to improvements in clarity and pre-boil gravity. If not, a longer mash time might be necessary. I agree with those suggesting incomplete conversion as the likely culprit. But to answer your question. No, you shouldn't have continued to vorlauf. Assuming your not draining out too fast or disturbing the grain bed when adding the wort back in, you should have had pretty clear wort after half of what you did. For the five gallon batches I do, I have reasonably clear wort after 2-3 quarts. When I add the wort back in I pour it into a partially submerged soup ladle so the flow of wort spreads on the top of the mash and not into the grain bed. That’s really interesting that you get clear wort so quickly. I use a gallon pitcher, so 4x the volume you do every time, and it takes me multiple passes. In all honesty, I’m downright shocked you only do 2-3 quarts. Even in the “all-grain 101” informational movie on northern brewer, it takes much more than 2-3 quarts. A real issue could also be the speed at which the wort was coming out of the tun. If he opened the valve 100% and wort came out super quickly, it will obviously take much more vorlaufing to accomplish the goal. Even still, the process takes me over a half hour every time I brew. There’s no way for me to go so slowly that I would do 3 quarts in 30 minutes... so what is your secret to accomplishing clear wort within (what I assume) is ten minutes or so? Do you check efficiency? And if so, do you see a really low efficiency going as fast as you do? Or is your goal to get no debris, but cloudy wort is Ok? When I vorlauf I drain very slowly, almost at a trickle. I've never timed it but I would guess it takes about 15 minutes. I definitely don't get clear wort. My goal is cloudy-not-clear wort, which is due primarily to my being impatient. Next time I brew, I'll vorlauf until clear and see how long that takes and how it affects my results. I usually have a significant amount of trub in the kettle so maybe I can reduce that. My conversion efficiency is usually in the low 80s. I hate this part of brewing, even more than bottling, so I bought a chugger pump to take the wort out of the tun and back up to the top. That way I can just turn the pump on and let it go for a while, rather than (pour into pitcher...pour back into run) over and over. @GoBlue59, which Chugger pump to you have? Would you recommend it? If my vorlauf-until-clear experiment yields positive results I may have to bite the bullet and get one. When I batch sparge I vorlauf untill the wort doesn't have grain in it. The wort is always cloudy 80% extraction. BIAB is also cloudy get 85% . Never tried to drain slow the opposite actually. I'd look at your crush for efficiency issues. Brew stores around here don't crush that tight. Sell more grain that way. And yes oxidation is not a problem before fermentation the opposite actually. I have only used it once, but it worked well. It has some drawbacks, as most do. It can’t self prime, which means that if you turn it on without liquid flowing inward to the pump, you can burn it out or damage it. The reason that stinks is... to clean it out and make sure you get all the wort back out... you basically have to feed hot/clean water into it after you are done with pumping wort. Now... that’s not a huge deal, you’re going to sparge immediately afterwards anyways... but for me, I have built a small-ish brew stand that has all the fixings of an electric brewery. So, it’s not great to have to use two hoses for the inlet, one that I connect to the lauter tun, and the other to the hot liquor tank. The hot liquor tank is located (obviously) higher on the stand than the lauter tun, so I needed to use a different/linger piece of hose. Not a huge deal, just had to buy a longer overall piece of hose to make the two separate hose lengths. Once the water entered the pump, I shut off the power, blew some compressed air into the hose, then disconnected everything and started my sparge. Also, the mounting holes on the base are located a little too close to the actual pump for my liking. This means that mounting the pump is a little harder. I mounted mine vertically, and I had to do some fancy finagling to get it to mount nicely. Taking it off these mounts is also a slight challenge, so again... cleaning after use is a little tough if you happen to actually mount it to something. 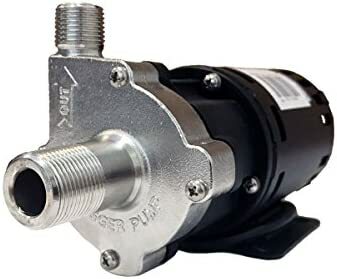 I still wanted to clean out any residues and eliminate any water inside the pump head, to prevent mold and bacteria for whenever I use it next. When I vorlauf I drain very slowly, almost at a trickle. What about after the vorlauf? I can't imagine you lauter and sparge at a trickle. I do think I opened my spigot... if not all the way, then pretty close. I'll do that differently the next time I brew. You don’t need to sparge at a trickle, but you shouldn’t be at full blast either. To me, sparging slowly is more important than vorlaufing slowly. I can’t speak for anyone else’s methods, and I’m definitely not someone who knows what the experts say... but sparging usually takes 30 minutes or more for me. So, it’s not at a trickle, but it’s not super fast either. I would say I open my lauter tun valve about one-third of the way open at maximum. Definitely less than halfway open for me.